Germany is known for its strong social system. Still, it's not uncommon to see people in need of some extra cash rummaging through public trash cans for old bottles that carry a deposit. 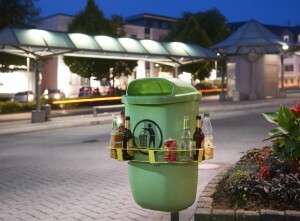 Beer bottles are worth just 8 cents, but most plastic bottles can be redeemed for 25 cents.